Central park in the Fall is just beautiful. It seems every time I have visited NYC it was either blazing hot or freezing. It was the perfect weather on this day, so I had to walk all over central park to see everything. 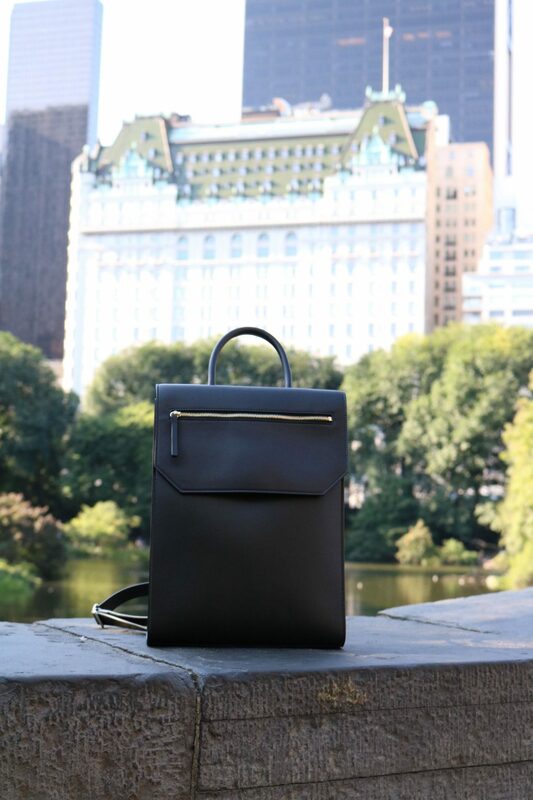 I was so thankful to have this versatile backpack with me the whole time I was up in city. This Chandra Keyser bag can be a cross body and backpack as seen in the pictures above. I couldn’t believe how easy it was to transition from the backpack style to the cross body and then back again. When I saw the bag online for the first time I had my questions on how easy it would be to switch between the two styles but my mind was blown when I was able to do it in just 5 seconds. I love the clean crisp look of the bag and it makes sense, because it is all made in Italy with Italian leather. The craftsmanship is just hands down wonderful. You can shop this entire outfit below and the bag here. I hope everyone is having a fantastic week! such a good bag, super cute shoes as well! Definitely a great and versatile bag! I love that top with the tie detail too. Very cute outfit. I especially love your top! So cute! Super cute an casual look! Looks like such a handy bag! Love this outfit too girl, great pairing of the ruffles with a more relaxed blue denim! Love visiting Central Park! Also that backpack is super cute!